Today’s tough economy has forced many to trade “moving up” for “fixing up”. Home improvement tasks can prove daunting if you have little time or money to spare. Dremel has teamed up with Home Improvement expert Paul Ryan, the host of “Kitchen Renovations” on DIY Network, to offer easy-to-follow tips for completing 10 of the most common home repair and remodeling projects – all in 30 minutes or less! Are you up to Dremel’s task? In addition, Dremel is giving YOU the opportunity to flaunt your home improvement skills, and win big prizes, with the 30 Minute Miracles contest. Contest runs from November 2nd – December 31, 2009 – There’s still time to get your entry in! Grand prize winner will recieve a $2,500 American Express Gift Card. Two additional winners will receive a $1,000 American Express Gift Card, or $500 American Express Gift Card. Open to US. residents age 18 or older. Winners to be announced by February 5, 2010.
and where cow girls and cow boys have fun. I’m pretty sure that by now, most (if not all) of readers are well aware that I’m a bit of a country girl. Little Journeys Baby World is too cute for words. And they aren’t geared only “country”. But other ethnicity’s as well. The lines that Little Journey’s has created are just adorable. Check out Bonjour Little Sweetheart, sooo cute. We are expecting FOUR new babies between Feb. and end of March. I call them our soon to be Spring Babies. Springin’ up! Caroline Riepler the founder started her first business in 2001 handcrafting (Woodcarving) European Good Luck Witches, which she takes great pride in that Madeleine Albright the former Secretary of State of America has one of her limited editions. Starting from her home in Colorado, Little Journeys Baby World first supplied her products to friends and family, local shops, and special events. And now available through the World wide Web. Soon after that in 2003 Caroline became pregnant with her son Stefan and Little Journeys Baby World was born. Unfortunately, things turned bad in 2004 when her Son, Aunt, two Dogs and herself got hit by a drunk driver. It took about 4 years to get back on track again into doing what she loves the most of being with her family and friends, traveling and her dream business Little Journeys Baby World. Little Journeys Western Wear line was selected to be one of the sponsors at the Canadian Country Music Awards 2009! Little Journeys Baby Wear is offering one NetWorkingWitches reader a Sheriff T-Shirt (size M 12-18 lbs). Caroline is a WAHM, let’s show her the love from other Moms! Her products will make SUPER baby gifts! Take a peek. MANDATORY Entry – Visit, Little Journeys Baby World and tell me another item she makes that you would love to get for a little one in your life. Extra Entries: The mandatory entry MUST be completed or no extra entries will count. They can, and will be deleted, 1 entry unless specified otherwise below. 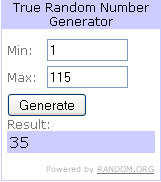 You MUST leave a separate comment for each entry, otherwise it will count as one entry. ~ Become a Friend/Follower on Little Journeys Baby World on their Blog. ~ Join Little Journeys Baby World Mailing List. ~ Follow Little Journeys Baby World on Twitter. 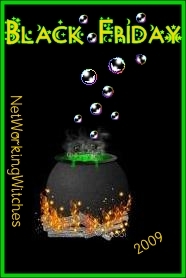 ~ Follow Networking Witches , WinterWitch and/or RedNeckWitch on Twitter (1 entry for each followed) And please send the below tweet. ~ Stumble this post, not the site. ~ Digg this post, and leave a link to the Digg, and your username. This giveaway will end on 12/05/09 at 11:59 PM CST. I was sent a Little Journey Baby Wear item for review, I was not paid any monetary compensation for this review. This post is my opinion and should be taken as just that. Having received samples has no impact on my personal use, experience, or like for any product. Every things nice with a little sugar and spice. Isn’t it? Ohhh yes, it is. Cowgirl Chocolates can prove it. When the package arrived from Cowgirl Chocolates, and I opened the box and saw the gorgeous red box inside, I didn’t want to open it! It was so pretty, wrapped in ribbon, adorned with the sweet little star on top. Being the country girl I am, I was in love. Marilyn, the head cowgirl over there, has great taste! This is chocolate with a kick. Whatever your chocolate need be. Ladies, we all have a need for chocolate at one time or another. How many occasions can you think of? Cowgirl Chocolates creates a “just because” chocolate occasion, sporting the spiced up flavors that’s sure to make your toes curl! After I finally opened my pretty little red box, my husband walked by and nabbed a piece of candy. He just happened to pick up Buckin’ Hot Habanero Caramel, HA! He ran with it. Straight to the sink for water. That’ll surely teach him to nab my goodies again. Now the mix of chocolate and spices are good, really good! But not all will set you on a running trip to the waterin’ hole. My daughter and I got to taste some of the Cowgirl Chocolates that didn’t have a kick. One of our favorites were Raspberry lemonade dark chocolate, an old cowgirl recipe blended to perfection with raspberry, lemon and deep dark chocolate. And on my “to get” list is Sarsaparilla Milk Chocolate, milk chocolate swirled with sarsaparilla (root beer) from the good ol’ days. Why don’t you wander on over to the Flavor Guide, and see what you can find that you’ll like. With or without a kick. I love the keepsake packaging they have. Head Cowgirl Marilyn Lysohir founded Cowgirl Chocolates in 1997. York Times and Toronto Star among others. Cowgirl Chocolates is kindly offering one of our readers a 1/3 pound sampler package of their chocolates! Don’t want to wait to see if you win? Then you can purchase the same sampler for $12.95. MANDATORY Entry – Visit Cowgirl Chocolates, and tell us what flavor(s) you would like to try the most. This giveaway will end on 12/0509 at 11:59 PM CST. I was sent Cowgirl Chocolate samples for review, I was not paid any monetary compensation for this review. This post is my opinion and should be taken as just that. Having received samples has no impact on my personal use, experience, or like for any product. To enter, just sign up for Vat19.com Email Newsletter. Prize package to be valued at over $325! The giveaway includes the following 19 products. You know, because we’re Vat19! One email address will be chosen at random from all of the email addresses signed up for Vat19.com’s newsletter. The drawing will take place at 5:00 PM CST on Cyber Monday (November 30, 2009). This giveaway is open to US shipping addresses only. If you are already signed up for Vat19.com’s newsletter, then you’re already entered! Make sure you click the confirmation in your email to verify. You can read a bit more on the Vat19 blog! I recently came across the cutest site. It’s call Print Art Kids. Right away it stood out as different. 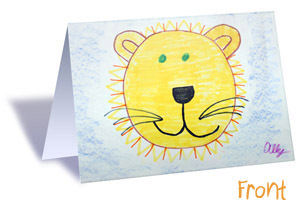 Print Art Kids allows you to change your children’s or even your own artwork into note pads, cards or other really neat items. I was given a selection of products to sample and review. I’m really impressed with the quality of the print and with the quality of the paper/stock it is on. Some of the products can even be customized with personalized messages in a variety of fonts and colors. Holiday Cards and Postcards can be created using multiple images. Captions are an option on the backs of all Note Cards, Holiday Cards, and Notebooks. Print Art Kids also offers Gift Labels and Return Address Labels. 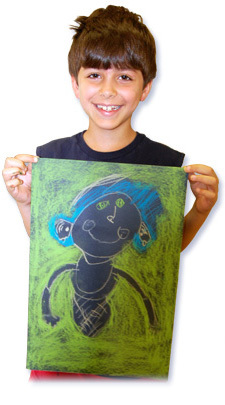 Turning your child’s artwork into useable items for family and friends for Christmas, Birthday, or other holiday gifts would be a treasured gift. Print Art Kids is an easy 5 steps. Step One Choose a favorite from your child’s art collection. Step two take a digital photo of the artwork and upload it to your computer. You can also scan the artwork directly to your computer. Step three Select the item you wish to order form “Our Products,” then click on “Order Now.” Step four upload your image, then follow the easy step by step instructions to create. Step five, add the item to the shopping cart and continue shopping or check out to place your order. Abbe from Print Art Kids is giving one lucky winner a free set of 4.5 x 5.5 art note pads with a value of $25.95. Check out Print Art Kids and tell me what art image you would use and what item you would order it on. 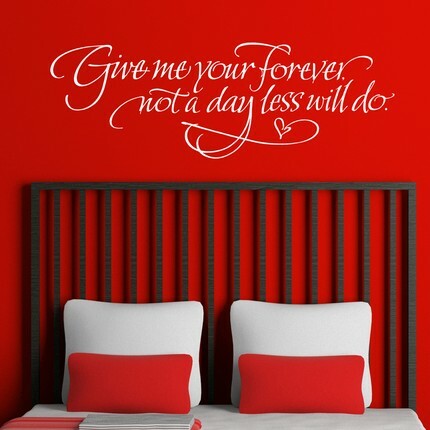 Lets talk wall art. I love it. It brings a lot of class to a room. Old Barn Rescue Company has beautiful wall art and so many alternatives to achieve the look that you wish. Old Barn Rescue Company began by producing and working with vintage materials to make whimsical home decor. Knowing they could not mass-produce their vintage materials and did not want that compromised they did some exploration and began their Wall Graphics Division. I received this wall vinyl and it’s beautiful. Wall Vinyls from Old Barn Rescue Company are easy to use too. The vinyl comes with instructions for applying. Not only can these be put on your walls they can be applied to car windows. Old Barn Rescue Company even has Christmas vinyls and is a great way to decorate and not go over your budget. Old Barn Rescue Company is very affordable. Old Barn Rescue Company specializes in hand-lettering by one of the Old Barn Rescue Company’s owners, Adonna who started with Scrabble tiles and moved on to hand-painting quotes and words on many of their items. Old Barn Rescue Company is generously giving away the above 30×12 A girl must be two things, classy and fabulous vinyl wall graphic lettering words quotes custom decor art decals custom old barn rescue in the winners choice of color. Head on over to Old Barn Rescue Company and tell me which other vinyl you like besides the ones listed here. Giveaway ends 11/28/2009 @ 11 pm est. Everyone needs snacks for the holidays organic or not. It’s a need for the season with parties and gatherings. Why not “Health It Up” with something that is better for you? I received a box of snacks from Good Health Natural Products. Losing taste by going organic? Not with Good Health Natural Products. Quite honestly I seriously don’t think I’ll go back to regular junk. The cost of these snacks are the same as all the others on the shelves. I was convinced that I didn’t like the Polenta Corn Chip. I had to do my duty *sigh* so I popped a couple in my mouth and HEY they weren’t that bad. In fact they were good. Really good. They come in 4 great flavors too. The Humbles, hummus chips are my favorite. These chips are addictive my family ate them kind of like crackers with soup and sandwiches. The best I can describe these is that they are light and airy with lots of flavor. Veggie Stix come in Hot or Regular. Hot is nice and spicy and a happy medium heat. These were my kids favorite and my youngest wants to take them to his class for snack day. The Olive Oil and Avocado Oil Chips are really good and taste exactly like regular kettle chips. They have a nice crunch and go great with a sandwich or dip. Lastly is the popcorn. It is really good and is a great treat with hot chocolate or while you are watching great holiday movies curled up with the family. Good Health Natural Products is generously giving one Networking Witches reader an assortment of their snacks. Go to the Good Health Natural Products website and look at their great snacks and tell me what snacks you like and pick carefully because you may get those snacks. Be sure to check out the very generous entries for following Good Health Natural Foods on Twitter! 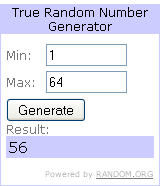 Congrats Angela G., random.org chose your #. Sending you an email now, as always please reply within 48 hours or we’ll have to choose a new winner!